The gun grabbers are in full panic mode. They are using any and every means at their disposal to attack gun owners. It’s only going to get worse as we head toward the general elections in November, and we’ll need your help to stop them — more on that in a second. The desperation of gun grabbers to get some sort of victory has been evident the last few days. They were in full meltdown mode over Justice Kennedy announcing his retirement. Their fear is that President Trump will pick another Scalia type Justice, and then 2nd Amendment cases will be taken up and won for gun owners. That’s something we haven’t seen in many years. However, their true desperation was on full display yesterday on Rep. Priscilla Gidding’s (Idaho-District 7A) Facebook page. Rep. Giddings (Republican) was attending the GOP summer convention and took a picture with several gun grabbers protesting at the event. Little did she know that the picture and her post would go viral. Above you can see several signs the protesters are holding. The sign in the middle mentions that you don’t have a right to bear “artillery,” which we can’t already. This protester was either completely ignorant or deliberately lying. Rep. Giddings, an A10-Warthog Airforce pilot, posted her picture along with a post. Her post asked her audience if she should show them the EMPTY 30 mm shell in her truck. 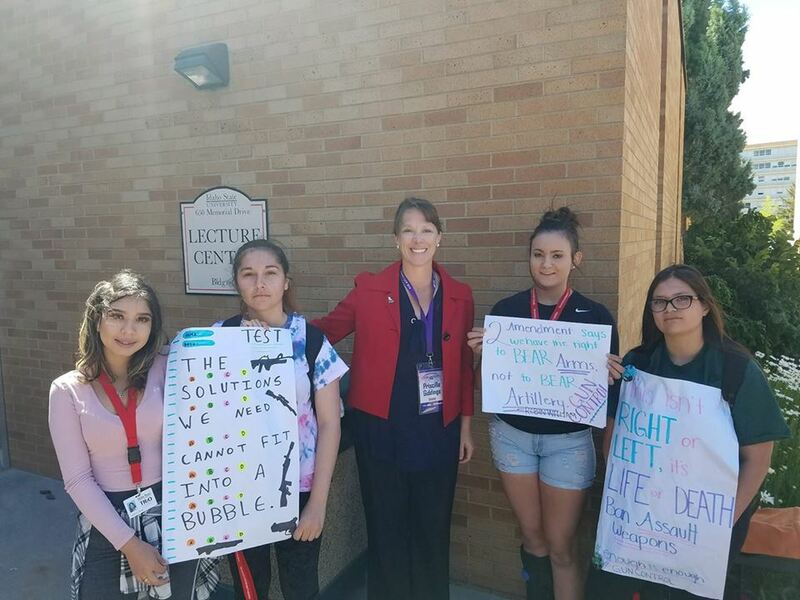 It was a clear reference to the gun grabber with the “artillery” sign, and that maybe she should take the opportunity to educate the protester on the difference between civilian and military weapons. She didn’t attack their freedom of speech. But that’s not how the gun grabbers took the post. Rep. Gidding’s Facebook page was immediately bombarded with lunatic leftists from all over the country. They claimed she threatened the students. Threatened them with a hunk of metal? The keys in her pocket are more dangerous than an empty 30 mm shell, which are often used as shot glasses. But that didn’t stop a slew of idiotic comments, including death threats and hopes of violence against Rep. Giddings for her post. Make no mistake folks, this is fake outrage. The left needs something to be angry about because with the economy doing really well, and Trump being able to pick a new Supreme Court Justice, nothing is going their way. Is the “blue wave” we have heard so much about crashing down on top of them? Either the gun grabbers have nothing better to do, or they are desperate for a victory. Many of them are asking Rep. Giddings to resign. Clearly, they don’t know the Idaho fighting spirit, or Rep. Giddings. However, this should be a warning to all Idaho gun owners. The radical left is here. They are doing everything in their power to change Idaho. Gun grabber George Soros has family members donating to Paulette Jordan’s campaign. She is the Democrat running for Governor in Idaho. This isn’t hyperbole, and it isn’t a joke. These people have ruined Oregon, Washington, Colorado, and now they have their eyes set on more “conservative” states like Idaho. It’s up to you to help us fight back. >>> First, become a member of the Idaho Second Amendment Alliance today if you aren’t already. If you are a current member, then please consider a special donation to the ISAA today. >>> Second, make sure to follow us on Facebook. Social media is often our quickest way to communicate important information to you. >>> Finally, please forward this email to as many Idahoans as you can. All Idahoans need to know what we are up against. With the phony outrage over Rep. Gidding’s post continuing to go viral, we have to prepare for the coming battle in November. Don’t lose sight of the bigger picture, protecting Idaho from gun grabbers and their deadly policies. P.S. Gun grabbers have found their latest fake outrage in the form of a picture/post from Idaho’s Rep. Priscilla Giddings. Even gun grabbing Chelsea Clinton was “triggered” by the picture. The progressives are desperate for a win, and their phony outrage over Rep. Gidding’s picture may show the depth of their desperation. But we can’t lose sight of the fact that they have turned their eyes to Idaho for a win. Please help us fight back by joining the Idaho Second Amendment Alliance today or, if you are already a member, please consider a special donation to help us mobilize gun owners across Idaho.